In this tutorial, I’m assuming you understand how to search within the CareStarter platform. If you do not, then please click here. 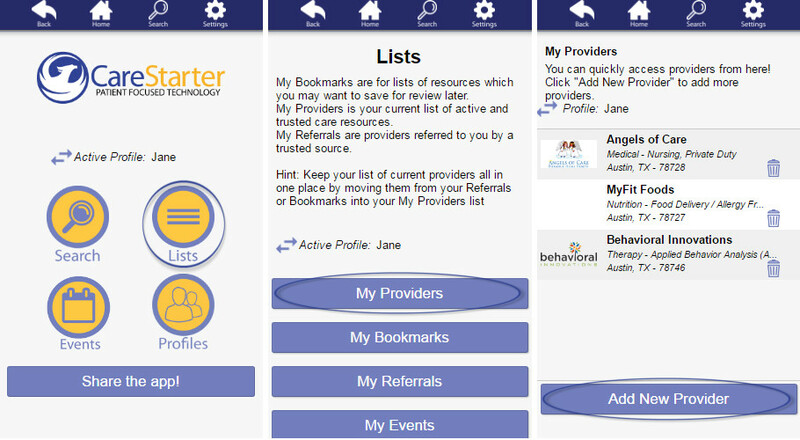 On the home screen, select “Lists.” On the next screen, you will click the “My Providers” button where you will then either access your already established Provider Lists or you can Add a New Provider. Each patient or profile listed on your account has a different list of providers. You can access your list and select them individually to be connected to their phone number, website address, or physical office location. *Note: A bookmark is different than a provider list. Click here to read more about bookmarks. Adding a resource as a provider means that you or one of the patients listed under your profile are actively visiting them as part of a diagnosis. Once you select “Add New Provider,” you will be prompted to search either by keyword or category. Select the provider you wish to add to your list. You will be directed to their profile page where you will select “Add to List” and then "Add to My Providers..."
Going forward, any time you log in or access the home screen, you simply select "Lists" to be connected to your provider list. If a provider isn’t listed, make sure that you have selected the correct patient profile.